The astronomer Hugh N. Ross now seems to be the world’s most prominent ‘progressive creationist’ (PC). While he is insistent about distinguishing himself from ‘theistic evolutionists’ (TEs), Ross adopts the same basic philosophical approach. That is, he makes uniformitarian (i.e. essentially materialistic, billions of years, etc.) ‘science’ his authority over Scripture. Formatted as above (starting a new line and changing the font style from small capitals to italics after ‘Ph.D.’), this gives the first impression to a skimming reader that Conner has a Ph.D., because only after careful inspection is it clear that he is a Ph.D. candidate, i.e. not actually qualified. The worst part of Ross’s teaching is the gross liberties he takes with the scriptural text. He does this to fit the canonical 66 books into what he calls the ‘67th book’, nature.1 What he means by ‘nature’ is the uniformitarian interpretation of nature. However, the creation is cursed (Genesis 3:17–19, Romans 8:20–22) and man’s heart is deceitful (Jeremiah 17:9) and the thinking of a godless man is ‘futile’ (Romans 1:21), while Scripture itself is ‘God-breathed’ (2 Timothy 3:15–17). So a biblical Christian should not reinterpret the perfect, unfallen Word of God according to fallible theories of sinful humans about a world we know to be cursed (Genesis 3:17–19, Romans 8:20–22). Ross’s heterodox canonisation of nature has been thoroughly rebutted by Van Bebber and Taylor.2 Their book, Creation and Time: A report on the Progressive Creationist book by Hugh Ross, is valuable reading for defenders of the biblical worldview, as it answers point-by-point Ross’s earlier theological and historical errors.1 However, The Genesis Question repeats many of the same errors. Ross routinely gives audiences the impression of being very familiar with Hebrew. However, in a meeting with Dr Ross on 12 April 1999, Dr Russell Humphreys asked Ross in Hebrew: ‘Do you speak Hebrew?’ and Ross was clearly uncomprehending. Humphreys then said (in English): ‘You must respond in Hebrew’, to which Ross admitted his inability by responding (also in English) ‘I can’t.’ Humphreys hastens to add that he himself is not expert in Hebrew, and nor am I, but we at least know enough to understand the question and to reply using the Hebrew word for ‘no’. Ross’s ignorance of Hebrew shows when he tries to discredit the common creationist identification of behemoth in Job 40:15–24 with a sauropod [see Could Behemoth have been a dinosaur? ], because he believes the dinosaurs became extinct 65 million years ago. Ross writes (p. 48): ‘The Hebrew word for “behemoth” appears in its plural form, behema, …’ However, even beginners in Hebrew know that –a is often a feminine singular and –oth is a feminine plural. So Ross got it back-to-front: behema is the singular form, while behemoth is grammatically plural. It is a figure of speech known as an intensive plural or plural of majesty, where ‘the referent is a singular individual, which is, however, so thoroughly characterized by the qualities of the noun that a plural is used’,3 ‘beast of beasts’. The context says that behemoth is the largest beast God made. And Job 40:17 says: ‘His tail sways like a cedar’ which certainly doesn’t fit Ross’s suggestion of a hippopotamus (unless it was a bonsai cedar, maybe). However, this is typical of Ross’s imaginative eisegesis. Genesis 1:25 teaches nothing so restrictive. And his analysis of Hebrew terms has no basis—Ross’s own source, the Theological Wordbook of the Old Testament (TWOT),5 doesn’t support him. Chayyāh is simply a generic word for a living creature although it can often refer to wild animals (TWOT 1:281)—the phrase נֶפֶשׁ חַיָּה (nephesh chayyāh) is used of sea creatures in Genesis 1:20, and of man in Genesis 2:7. Behema refers to both wild beast and domesticated animal (TWOT 1:92). Remes describes small creeping animals ‘especially reptiles’ (TWOT 2:850). The TWOT shows that Ross is ‘over-defining’ these terms. Note that even if we grant Ross’s contention that remes means ‘short-legged land mammals’, it still doesn’t match the uniformitarian order in the fossil record. Such creatures are alleged to have appeared millions of years before whales, which Ross identifies as created on the millions-of-years-long ‘Day 5’. And mesonychids, the alleged predecessors of whales, were certainly ‘long-legged mammalian quadrupeds’, so would fit even Ross’s descriptions of Day 6 creatures. So Ross, despite a demonstrable ignorance of even the most basic Hebrew and an inability to use Hebrew lexicons correctly, discovers amazing insights, thanks to ‘science’. This claim by Ross, like so many others, is a denial of the perspicuity of Scripture. I.e. God’s people were left entirely in the dark about Genesis until modern uniformitarian theories were invented—mainly by bibliosceptics. Ross’s ideas are not only fanciful science, but bad exegesis of Hebrew. The Hebrew word ‘asah means ‘make’ throughout Genesis 1, and may be used interchangeably with ‘create’ (bara’), e.g. in Genesis 1:26–27. It is pure desperation to apply a different meaning to the same word in the same grammatical construction in the same passage, just to fit in with atheistic evolutionary ideas. If God had meant ‘appeared’, then He would have used the Hebrew word for appear (ra’ah), as when the dry land ‘appeared’ as the waters gathered in one place on Day 3 (Genesis 1:9). This is supported by Hebrew scholars who have translated the Bible into English. Over 20 major translations were checked, and all clearly teach that the sun, moon and stars were made on the fourth day. Genesis 1 modifies the creation days with both ‘evening and morning’ and a number, almost as if God was trying to make it as obvious as possible that they were ordinary days. Exodus 20:8–11 reinforces the point that the six days of creation followed by a day of ‘rest’ were the basis for the Israelites’ six-day week and seventh day Sabbath. The phrase ‘during the day’ is also obviously the daylight hours, as per Genesis 1:5. Ross also claims (p. 65): ‘In biblical Hebrew, no other word besides yôm carries the meaning of a long period of time’ and cites his own book1 and TWOT.5 Again, Van Bebber and Taylor pointed out11 that Ross’s own source contradicts him, stating that the Hebrew olam and its Greek equivalent aion (from which we derive the word ‘eon’) often means ‘long age’.12 There were plenty of other words that God could have used if He had wanted to teach long periods of time.13,14 God could also have used phrases like ‘x myriad myriad years ago’ to teach ages of hundreds of millions of years. For a less precise indication of vast ages, God could have compared the years to the number of sand grains or stars. Yet God did not use any of these—rather, He emphasized literal days. ‘Each of the six creation days closes with the refrain: “There was evening, and there was morning,” then the day’s number. The statement suggests that each day had a start time … and an end time. However, the refrain is not attached to the seventh day. Its closure is missing. A straightforward reading of the biblical genealogies according to the reliable Masoretic text19 shows that Adam was created about 4000 BC, and this was on Day 6 of creation.20 And Jesus said: ‘But from the beginning of the creation God made them male and female’ (Mark 10:6), not billions of years later. But Ross dates Adam at about 35,000–47,000 BC, based on secular chromosome research (p. 111), i.e. almost at the end of billions-of-years old creation. However, none of Ross’s examples of gaps in genealogies (Matthew 1:8–9 vs 1 Chronicles 3:10–12) mention the age of the father at the birth of the next name in the line, so are irrelevant. Ross also points out that father can mean grandfather or ancestor, while son can mean grandson or descendant. But Ross again errs by unwarranted adoption of an expanded semantic field.10 The Genesis 5 and 11 genealogies say that X ‘begat sons and daughters’ implying that Z is likewise a son of X in this specific context. Barr, consistent with his neo-orthodox views, does not believe Genesis, but he understood what the Hebrew so clearly taught. It was only the perceived need to harmonise with the alleged age of the earth which led people to think anything different—it was nothing to do with the text itself. ‘Chinese historical accounts placing Chinese national origins earlier than 4004 BC. … The same reaction comes today from … Australian Aborigines, who date back to 25,000 BC …. All are firmly established dates.’ (p. 108). However, the Encyclopædia Britannica says on China: ‘The first dynasty for which there is definite historical material is the Shang, or Yin (18th–12th BC).’27 The Australian Aborigines were an oral culture, without writing, so their ‘dates’ are not based on historical records but on ‘dating methods’. However, some of these claim that Aborigines existed before even Ross’s ‘date’ for Adam—what will happen to his apologetics if such dates become widely accepted? Some Ross supporters like Dr James Dobson, of Focus on the Family, evidently believe the overwhelming biblical evidence for a global flood, but fail to see the inconsistency of this position with billions of years. A global flood would have laid down a vast thickness of fossil-bearing sedimentary rock in a year, which would nullify much geological ‘evidence’ for billions of years. Conversely, accepting that the fossil record was formed over billions of years eliminates any evidence for the Flood. Ross is more consistent, and believes the Flood was restricted to Mesopotamia. 21 Every living thing that moved on the earth perished—birds, livestock, wild animals, all the creatures that swarm over the earth, and all mankind. Ross caricatures belief in a global flood, parroting discredited sceptical/atheistic arguments against the Ark. Ross ignores key books like John Woodmorappe’s Noah’s Ark—a Feasibility Study,29 which answers nearly all his objections. This is why both Eskimos and native equatorial south Americans have mid-brown skins and haven’t developed very white or very dark skins—the relevant information is simply not present. Such ‘people groups’ today are highly specialised, with less genetic variation than mulattos (and Adam and Eve), which is why they produce offspring of limited variety. Because of Ross’s lack of knowledge of genetics, he postulates direct divine intervention at Babel to introduce ‘racial’ traits into separate populations (pp. 177–178). The Bible doesn’t even hint at this. Ross admits that it’s a ‘God of the gaps’ explanation, which would be unnecessary if he had read any of our books. Ross says that the different ‘racial’ characteristics were designed to aid man’s dispersal. This is disturbing—although Ross does repudiate racism and sees nothing wrong in ‘interracial’ marriages, this theory almost implies that God designed racial prejudice. If Ross had read basic creationist books, e.g. Stones and Bones, The Creation Answers Book or What is Creation Science? [or see the internet article How did all the different ‘races’ arise (from Noah’s family)? ], he wouldn’t need to resort to such daft explanations, which hardly give the would-be Christian apologist relying on his books any credibility. Another Ross flight of fancy—what other prophet needed a ‘platform’, let alone one requiring such a huge expenditure of labour? Akin to straw man arguments is guilt by association—Ross complains that a TV documentary about the alleged discovery of the ‘Ark’ gave the sceptics an easy target (pp. 165–167). The obvious implication is that it’s all the fault of global Flood proponents, although the major global Flood organisations have repudiated such claimed discoveries.38 Many creationists even agree with Ross that the Ark is unlikely to be found because its timber would probably have been used for construction, so that is hardly a unique local-floodist insight. Ross also copies the ploy of the apostate Ron Numbers,39 attributing biblical creationism and flood geology to ‘the visions of an Adventist prophetess [Ellen White]’ via George McCready Price. A number of papers by Dr Terry Mortenson in Journal of Creation show that the early 19th century scriptural geologists presented such ideas well before Price [see The 19th Century Scriptural Geologists, by Dr Terry Mortenson]. Ken Ham pointed out that he had never even heard of Price at the time he founded CSF/AiG, and that he adopted creationism because of the biblical teaching.37 Even if Ross were right about Price, he is wrong to think that discrediting Price is enough to refute creationism—this is a classic case of the genetic fallacy. Ross does accept the biblical long lifespans, and rejects any redefinition of the word ‘year’ (a pity he isn’t so careful with the word ‘day’). But in ch. 15, Ross interprets the 120 years of Genesis 6:3 as shortening of human lifespans. This is clearly fallacious because it contradicts other Scriptures showing that people lived for hundreds of years well after the Flood. The best understanding is that the 120 years was the time left for mankind before the Flood would destroy it, with only a remnant surviving on the Ark. Ross’s explanation for shortening human lifespans is: God supernaturally increased the rate of apoptosis (programmed cell death) to ‘protect’ us from an increasing-with-age risk of cancer in the aftermath of a radiation burst from the Vela supernova. But it’s bizarre to talk about ‘protecting’ people from cancer should they reach 500, 600, even 900, by making sure they become decrepit and die before 120! What next, ‘protecting’ people from Alzheimer’s disease at 80 by causing fatal heart attacks by 60? See also Cain’s wife—who was she? Some of Ross’s arguments are blatantly circular, in effect: ‘Isn’t it amazing how modern uniformitarian science backs up what Genesis says?’ Hardly surprising, because Ross has reinterpreted Genesis to fit in with uniformitarian science! Ross strongly overstates the case for fine-tuning of the earth and universe. He claims (p. 32) that Earth’s gravity is strong enough to hold lots of water vapour (relative molecular mass (Mr) = 18), ‘but not so high as to keep life threatening quantities of ammonia [Mr = 17] and methane [Mr = 16].’ Not true—earth’s gravity even holds helium (Ar = 4) strongly (incidentally, more helium from Î±-decay is released into the atmosphere than escapes into space, and the total amount in the atmosphere is evidence that it is less than two million years old45). We are protected from methane and ammonia because they are rapidly destroyed by UV light. Van Bebber, M. and Taylor, P.S., Creation and Time: A report on the Progressive Creationist book by Hugh Ross, Eden Productions, Mesa, AZ, 1994. See online chapters. Return to text. Exegesis means reading out of the text (i.e. letting the text teach you); eisegesis means reading one’s own ideas into the text. Return to text. Van Bebber and Taylor, Ref. 2, pp. 86–91. Return to text. Kelly, D.F., Creation and Change: Genesis 1:1–2:4 in the Light of Changing Scientific Paradigms, Mentor (Christian Focus Publications), Ross-shire, UK, ch. 2, 1997. Return to text. Carson, D.A., Exegetical Fallacies, Baker Book House, Grand Rapids, MI, 2nd Ed., p. 60, 1996. Return to text. Van Bebber and Taylor, Ref. 2, pp. 76–77. Return to text. Grigg, R., How long were the days in Genesis 1? What did God intend us to understand from the words He used? Creation 19(1):23–25, 1996. Return to text. Stambaugh, J., The days of Creation: a semantic approach, Journal of Creation 5(1):70–76, 1991. Return to text. Van Bebber and Taylor, Ref. 2, pp. 69–73. Return to text. Is the seventh day an eternal day?, Creation 21(3):44–45, 1999. Return to text. Kulikovsky, A.S., God’s Rest in Hebrews 4:1–11, Journal of Creation 13(2):61–62, 1999. Return to text. For a defence of the Masoretic text vs the altered Septuagint (LXX), see Williams, P., Some remarks preliminary to a biblical chronology, Journal of Creation 12(1):98–106, 1998. Return to text. Josephus, Jewish Antiquities Books I–IV, Harvard Press, Cambridge, MA, 1930, p. 73; Loeb Classical Library No. 242. Return to text. Sarfati, J.D., Cainan of Luke 3:36, Journal of Creation 12(1):39–40, 1998; see also Cainan: How do you explain the difference between Luke 3:36 and Gen. 11:12? Return to text. Pierce, L., Letter to the editor, Journal of Creation 13(2):76, 1999. Return to text. Kruger, M., Genesis 6–9: Does ‘all’ always mean all? TJ 10(2):214–218, 1996. Return to text. Woodmorappe, J., Noah’s Ark: a Feasibility Study, Institute for Creation Research, El Cajon, CA, 1996. Return to text. 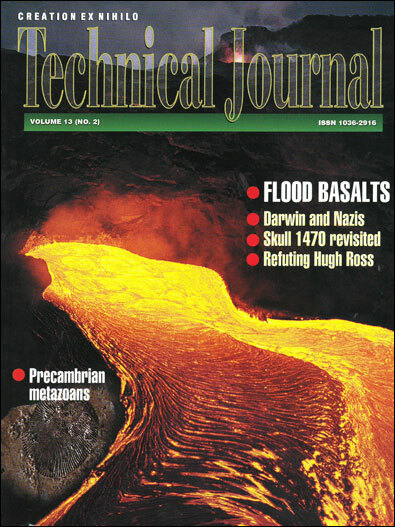 Wieland, C., Speciation Conference brings good news for creationists, TJ, 11(2):135–136, 1997. Return to text. Jerlström, P., Genomic imprinting, Journal of Creation 13(2):6–8, 1999. Return to text. Gish, D.T., Evolution: The Fossils Say No! Creation-Life Publishers, San Diego, CA, 2nd ed., p. 43, 1973. This book has been superseded by Evolution: The fossils STILL say NO! Institute for Creation Research, El Cahon, CA, USA, 1995. Return to text. Ham, K., Demolishing ‘straw men’, Creation 19(4):13–15, 1997. Return to text. Snelling, A.A., Amazing ‘Ark’ exposé, Creation 14(4):26–38, 1992. Return to text. See the review of Numbers’ historically unreliable (perhaps due to his anti-creationist bias) book The Creationists by Andrews, E., Origins (Journal of the British Creation Society) 8(20):21–23, 1995. Return to text. ‘Naval stores’, Encyclopædia Britannica, 8:564–565, 15th Ed. 1992; emphasis added. Return to text. Schönknecht, G. and Scherer, S., Too much coal for a young earth? Journal of Creation 11(3)278–282, 1997. Return to text. Woodmorappe, J., The antediluvian biosphere and its capability of supplying the entire fossil record, Proceedings of the 1st International Conference on Creationism, 2:205–218,1986. Return to text. Vardiman, L., The Age of the Earth’s Atmosphere: A Study of the Helium Flux through the Atmosphere, Institute for Creation Research, El Cajon, CA, 1990; see also Blowing old-earth belief away: Helium gives evidence that the earth is young. Return to text. Faulkner, D.R., The dubious apologetics of Hugh Ross, Journal of Creation 13(2):52–60, 1999. Return to text.